Anyone could find their perfect retreat in the Pyrenees, a range that encompasses in its four-hundred-kilometre length a diversity of landscapes rarely equalled in Europe. Between the balmy beaches of the Mediterranean and the more turbulent Atlantic coast lie regions of lush meadowland, peaks permanently clad in ice, sun-beaten canyons of sinuously sculpted rock, swathes of dense broadleaf forest, weirdly eroded limestone pinnacles and valleys so sheer and overgrown that scarcely a ray of light penetrates them. These mountains challenge and invite rather than intimidate. Generally rounded and crumbling, most of their peaks are attainable even to people with little experience of such terrain. Aneto, at 3404 metres the highest summit of the Pyrenees, stands within reach of any determined and properly equipped walker, as do all the next ranking peaks – Posets, Monte Perdido and Vignemale. Other natural wonders of the range are also available to the averagely fit. The Valle de Ordesa, the most spectacular of many canyons, can be traversed on nearly level footpaths, as can the great glaciated amphitheatre of the Cirque de Gavarnie, just to the north. The stalactite-draped cavern of Lombrives is the largest cave in western Europe to which there’s unrestricted public access, while a visit to the Sala de la Verna, the largest chamber in one of the world’s deepest cave systems – the Gouffre Pierre-Saint-Martin – requires no great physical effort. If you join an organized group, there are any number of lively rivers to raft down on both sides of the range, including the Noguera Pallaresa in Catalunya and the Gállego in Aragon, as well as several tamer ones on the French side. Canyoners of all ability levels are similarly well catered to in the "pre-Pyrenean" Sierra de Guara, also in Spanish Aragon. Walking the entire range from end to end has become a classic endeavour, and thousands of people have followed the Haute Randonnee Pyreneenne (HRP) just to either side of the watershed, or the more circuitous, but less demanding, Grande Randonnee 10 (GR10) entirely within France. These long-established footpaths were supplemented during the 1980s by the equally spectacular Spanish Gran Recorrido 11 (GR11); maps for every part of the Pyrenees show numerous other, briefer itineraries, suitable for hikers at all levels. The wildlife of the Pyrenees is exceptionally rich, despite the devastating impact of human activity on many of its most engaging species. Populations of deer and wild boar hide in the forests, and in certain dense woodlands a dwindling number of brown bear still manage to survive despite the depredations of hunters. In contrast, the ubiquitous isard – or Pyrenean chamois – is on the increase, as are shy wildcats; marmots are plentiful (and audible); while majestic birds of prey circle in the skies. The capercaillie, a game bird now extinct in the French Alps, still thrives in the Pyrenees, and the tiny desman, a sort of aquatic mole, is unknown anywhere else in western Europe, except the Picos de Europa. Traces of human habitation in the Pyrenees predate recorded history by thousands of years, with artefacts found (and often displayed) at a half-dozen caves in the Ariege, the Couserans and the Comminges regions. The prehistoric painted caves around Tarascon-sur-Ariege are rivalled only by those of the Dordogne and the Spanish province of Cantabria, with the paintings in the Grotte de Niaux rated as the best examples open to public view anywhere in the world. Architectural highlights of the Pyrenees are its extraordinary Romanesque churches and monasteries, of which there are literally hundreds, including such renowned examples as Saint-Martin-du-Canigou, Serrabone, Santa Maria de Ripoll, Sant Climent de Taull and a host of others in the Vall de Boi, Saint-Bertrand-de-Comminges, Saint-Lizier, San Juan de la Pena, and Saint-Engrace in the Haute-Soule. So-called "Roman" bridges still linking isolated villages are even older, though not necessarily pre-Christian. Towards the western half of the range, numerous monuments bear testimony to the thousands of pilgrims who during the Middle Ages followed the pilgrimage trail to Santiago de Compostela in Galicia via the fabled Puerto de Ibañeta near Roncesvalles, or the nearby Col du Somport. At the eastern end, from the Mediterranean to the Ariege, the strength of the heretical Cathar religion is reflected in many immensely evocative ruined castles, notably the crag-top citadel of Montsegur, site of the faith’s effective extinction. The people of the Pyrenees are as disparate as the landscape. The east and west ends of the range are the respective homelands of the Catalans and the Basques, each with a tenaciously preserved cultural vitality, as embodied in the sombre sardana, the Catalan communal dance, or the lightning-quick and potentially lethal Basque game of pelota/pelote. As you traverse the Pyrenees you’ll certainly hear Catalan, Aranese, Aragonese and Euskera (the Basque tongue), not to mention a few others – notably Occitan – not officially accorded the status of a distinct language. For centuries before the final unifications of France and Spain, every valley effectively constituted a mini-republic with its own argot and traditions, jealously guarding customary privileges against encroachment from distant central governments, and defying them further with a thriving trade in smuggling. Remoteness and neglect long made the mountains a refuge for political as well as religious dissidents, most recently during the Spanish Civil War and World War II when thousands of refugees took advantage of the shepherds’ and smugglers’ knowledge to evade capture. After 1968, hundreds of disillusioned French protesters and "alternative" types again took up residence in the back country, swelling the traditional local vote for the political Left – and adopting the long-standing local habit of self-sufficiency. Indeed the Pyreneans’ historical disregard for the often-altered boundaries between France and Spain has been vindicated and accentuated by the post-1993 European single market, as old border posts lie abandoned and a strong regional identity bridging the watershed seems set to reassert itself. After decades of playing second fiddle to the Alps, the Pyrenees have finally come into their own as a travellers’ destination. Infrastructure and amenities improve by the year, as exemplified by increasing numbers of quality lodgings (especially on the Spanish side), ever-multiplying adventure-sport outfitters and a plethora of no-frills airlines offering service into hitherto sleepy regional airports. It has never been easier to visit these mountains. Marc Dubin first went to the Pyrenees in 1986 - and thigh-deep in snowmelt, discovered why most facilities are shut in May. Since then he has returned several times to both sides of the range, on one visit toting a 23-kilo pack through the mountains in the course of researching a hiking guide to Spain. There’s something to do in the Pyrenees at all times of the year. Snowfall permitting, the downhill/cross-country ski season gets seriously under way in January, while spring sees high-level ski touring. With the spring thaw, rafting and canoeing become practicable, and then the long summer walking season begins in early June – also a good time for riding, cycling, and the more extreme pursuits of canyoning and parapente, the latter essentially a cross between hang-gliding and parachuting. In autumn the crowds depart and the mountain trails are left to solitary walkers not afraid of the odd snow flurry. The optimum time to visit obviously depends on what you want to do, but if possible you should avoid the French and Spanish national summer holidays, which run from mid-July to the end of August. It’s preferable to come after this lemming stampede rather than before: spring and autumn offer equal solitude, but high passes may still be blocked until July, and in September you’ll have the freedom of all the mountains. Besides the crowds, thunderstorms cause problems in high summer: the Pyrenees are very prone to them and during July and August several storms a week can be guaranteed. If you are out on the high peaks during summer you should always aim to be well down by early afternoon, when the storms tend to break. The weather in the Pyrenees resists generalization, as temperatures can be erratic owing to marine influences, and microclimates abound. In summer, the cooling action of the sea can give each coastal strip a temperature several degrees lower than a few miles inland, while for every 100–200m of ascent, the temperature often falls by as much as one degree Celsius. Thus a summer train-ride up from Barcelona to Nuria in Catalunya might take you through a drop of more than ten degrees. Conversely, there’s the common phenomenon of temperature inversion (especially on the French slopes), when the valleys become colder than the peaks, which protrude like islands from a white sea of cloud. The Bareges valley, for example, has particularly idiosyncratic weather, where a warm May can be followed by snowstorms in June. 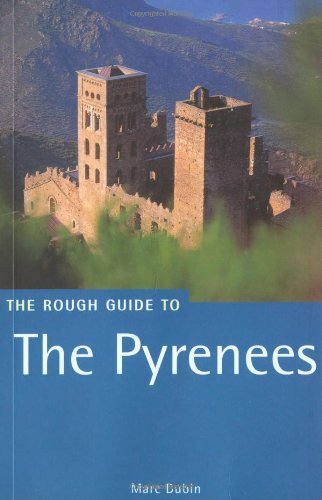 If you’ve only got two weeks at your disposal, the Pyrenees are too vast to tour in their entirety, but in places public transport is good enough to explore a region roughly corresponding to one of the chapters in this book. The rail networks will get you within striking distance of the most interesting areas, and buses are often available to take you deeper into the mountains. A circuit of the Eastern Pyrenees, for example, could begin at Perpignan, continue south by train along the Mediterranean coast, move west by road through the verdant Garrotxa to the Ripolles valleys; then north by rail to the sunny plain of the Cerdanya/Cerdagne, and finally return to Perpignan by another train through the dramatic Tet valley. Circular itineraries such as this can be constructed in many other parts of the range – around Andorra or in the Basque country, for example – and even isolated, underpopulated zones such as the central Maladeta and Posets massifs lend themselves to loops on foot from trailhead villages served by buses. With a car or bicycle, you could probably see the best of two consecutive chapters in two to three weeks. If you want to concentrate on one area, the Ariege will suit most tastes with its fabulous scenery, cave art, ruined castles and almost every form of outdoor activity. Over the border in Catalunya, the Parc Nacional de Aiguestortes i Sant Maurici, easily accessible from the Val d’Aran, makes an excellent introduction to the glacial glories of the higher peaks. Gavarnie, Bareges or Cauterets in France, and Torla or Bielsa in Spain, are comfortable gateways for the best of the French Parc National des Pyrenees and the Spanish Parque Nacional de Ordesa y Monte Perdido, the great, contiguous national parks in the heart of the range. For walks and climbs on the highest summits further east, make the all-purpose resorts of Benasque or Bagnères-de-Luchon your bases, while the westernmost high peaks – before the range dips below 2500m elevation – can also be easily explored from developed villages such as Lescun or Sallent de Gallego. During winter, most of these settlements are conveniently close to many of the best ski resorts, which include Candanchu-Astun, Bareges-La Mongie, Piau-Engaly, Peyragudes, Baqueira-Beret and Boi-Taull, many of them the equal of the better-known winter sports centres in commercialized Andorra. Towards the west end of the range, Pau is the largest and most cosmopolitan city of the Pyrenees, on a main transport route to Jaca, historic county town of the Aragonese mountains. They are the most logical and congenial gateways to the surreal karst country extending between the French Vallee d’Aspe and the Spanish valleys of Echo and Anso. Southeast of Jaca, beyond the sleepy provincial capital of Huesca, the Sierra de Guara is available for visits most of the year owing to lower altitude. Inland from the surf-pounded Atlantic coast, with its elegant resorts of San Sebastian and Biarritz, the seductively green horizons and sumptuous domestic architecture of the Basque country beckon, with graceful Bayonne and atmospheric Saint-Jean-Pied-de-Port as focuses. The Mediterranean beaches are more varied and – at least at the picturesque port-resorts of Collioure or Cadaques – more beautiful, and the climate reliably sunny. From here there are also opportunites for forays inland to the mysterious, volcanic Garrotxa basin in Catalunya or to the gorge-slashed foothills of the Canigou massif in Roussillon. Whichever part of the range you decide to visit, take the opportunity to sample both sides of the border if at all possible – the north-to-south change of landscape, climate and culture is one of the delights of the Pyrenees.